The Serpentine Galleries‘ two new exhibitions, one focusing on the art of Haim Steinbach and another showcasing modern interior designs curated by Martino Gamper, deal with the value and status of material objects in similar, boundary-crossing ways. Steinbach’s practice consists primarily of taking existing objects – anything from kitsch salt and pepper shakers donated by the public to artwork donated by the V&A – and displaying them together with no hierarchic distinction. This act of displaying objects, whether it be on hand-made shelves against vintage wallpaper or on construction scaffolding, has a defamiliarising effect that blurs the boundaries between low- and high-brow art and the public and private spheres. The result is not so much that Steinbach elevates humdrum objects into the realm of high art, but rather that he transforms the art gallery itself into a series of small spaces with a cosy, domestic feel, giving a sensation similar to walking through the rooms of a bizarre, out-of-date private residence. The objects on show are thus imbued with an inherent value greater than their material reality; they are no longer simply things to be looked at but personal, perhaps even treasured, possessions, serving as a conceptual connection between the owner and the viewing public. The art of displaying things is also key to Gamper’s exhibition, which showcases objects – many from the designer’s own collection – exhibited on a variety of shelving systems designed since 1930. The material objects range from delightful glass paperweights to a selection of various types of brick, but the real stars are the shelving units themselves. The variety of different designs and materials used for the shelves is impressive, as is the sense of innovation and of radically personal style exhibited by the furniture designers on show. As with the Steinbach exhibition, the boundary between the private and public spheres is at the heart of Gamper’s show, which explores our emotional attachment to the collected objects and designs that surround us. Gamper exposes the dual nature of the collector in a celebratory way – a collection of objects is often the result of a private obsession, but putting these collections on display, even in the domestic space, is an act of public exhibition and an invitation to shared enjoyment. Haim Steinbach’s once again the world is flat is now closed. 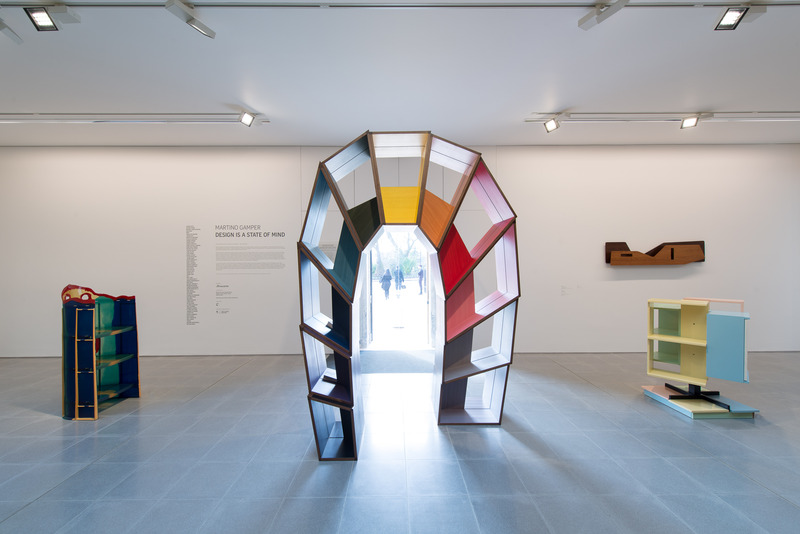 Martino Gamper’s design is a state of mind is on show at the Serpentine Sackler Gallery until 18 May.